Do you produce or aspire to produce artistic work which will help you to become an active agent for change and social justice? Is your work often about your identity, race/inclusion or marginalisation? Do you have lived experience of discrimination and/or racism which influences your creative output? 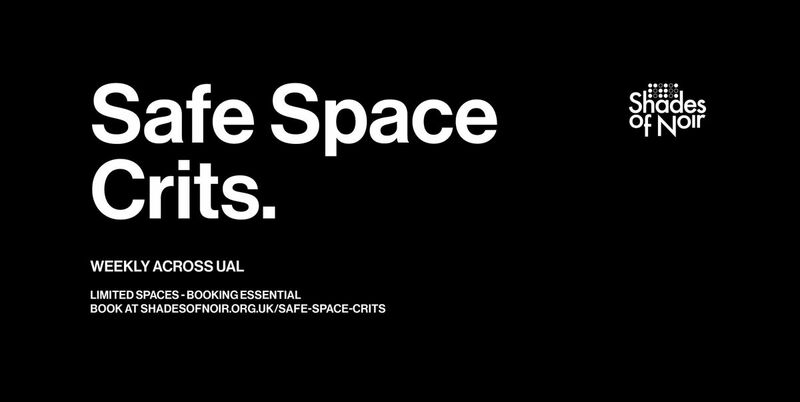 Then come to Shades of Noir Safe Space Crits, a small group setting in which you can present work exploring a range of issues. The sessions are facilitated and run by experienced creative teaching practitioners who have lived experience, historical understanding of marginalisation and a commitment to social justice pedagogy. Safe space crits use critical analysis and the careful consideration of issues of oppression to provide both deep knowledge and a direction for the application of that knowledge in students artistic practice. Safe space crits are an additional resource offered to students from marginalised backgrounds. Spaces are limited to a maximum of 12 students and booking through the form provided is essential. Please note that if sessions are fully booked please put your name on the waiting list. You will be contacted as soon as space is available.